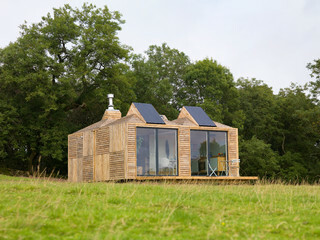 Ingenuity and creativity are essential when it comes to designing a small house, and especially a tiny one. I think that is one of the reasons I like them so much. 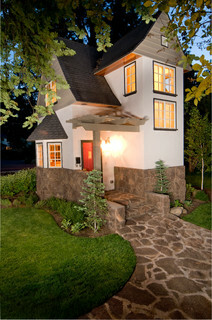 Planning a small house that does not sacrifice any of the design features or comforts of a big house is the challenge. 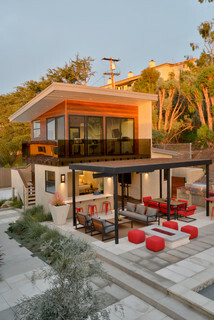 This includes making their exteriors look just as or more appealing and functional than a large house. I think many of the small houses shown below meet this challenge. In some ways, I feel they exceed what many big houses are unable to provide due to limitations in lot size and/or budget. Some of the small houses shown in these photographs may have been designed to be guest or vacation houses. But their design and size met my criteria. Enjoy the tour of these innovative small house designs. Outstanding large outdoor living, dining, and entertaining space. 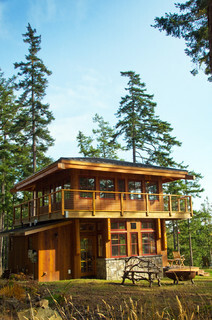 Reminds me of a forest ranger lookout station. Cool design. Clever integration of solar panels into the roof of this small house. The builder was able to achieve a Tudor look even with a small house. Unique clean, modern design. Large porch is nice! Finally, here’s my favorite of the bunch. 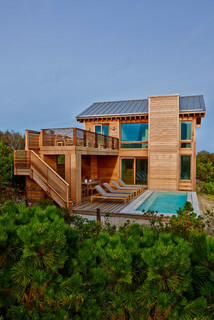 A small house, small (lap) pool, and small upper and lower outdoor living spaces. Love it. 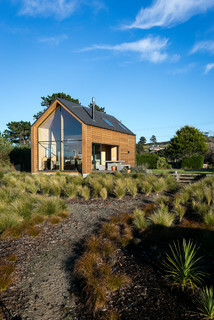 I hope you got some ideas and inspiration from these innovative small house designs.